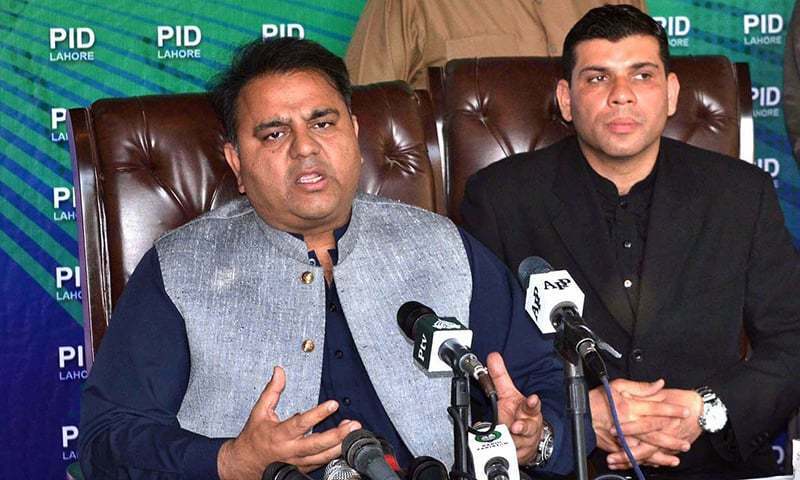 Information Minister Fawad Chaudhry on Sunday said that PPP Chairperson Bilawal Bhutto-Zardari should change his narrative of bashing the government and censuring the National Accountability Bureau (NAB), and instead “stand with Pakistan”. Addressing a press conference in Lahore, the information minister said that Bilawal should focus his energy on issues bigger than running a movement to “save his father as there will be plenty of time to do that later”. Bilawal’s father and PPP co-chairperson Asif Ali Zardari is currently embroiled in a NAB investigation regarding the use of fake bank accounts to launder money. “You should concentrate on bigger issues; this ‘if you ask us about Rs5,000 corruption then we will launch a movement against you’ is an inappropriate attitude and does not justify a political movement against NAB,” Chaudhry said, addressing Bilawal. Last Thursday, Bilawal at a press conference had said that he does not trust the PTI government to crack down on banned organisations and demanded the removal of a trio of ministers from the federal cabinet, whom he accused of having “long-held ties” with members of proscribed groups. Responding to Bilawal’s allegations, the information minister said that the young parliamentarian is in need of a deeper assessment of the facts and history within his own party of similar “long-held ties”. “Bilawal has not assessed this fully. If only he had looked at who Qamar Zaman Kaira and Khursheed Shah had been pictured with he would not have made such statements,” he said. The information minister went on to claim that “the two favourites” [Bilawal and Maryam Nawaz] pose no political challenge to the government. “We are of the view they have just begun [their political career] and we hope that they serve people and engage in philanthropy [before jumping into the deep end of politics]. They should at least get a job for six months so they know what life is like [for the common man]. It is not appropriate to engage in politicking over abbu’s (father’s) money,” said Chaudhry. PPP issued a quick response to the information minister’s remarks, terming him the “Goebbels (referring to the propaganda minister of Nazi Germany) of the puppet government”. “The country knows that Pakistan Tehreek-i-Insaf and Tehreek-i-Taliban Pakistan are two sides of the same coin,” alleged PPP leader Nafisa Shah. “Bilawal’s statements hurt Imran Khan and when Imran Khan is hurt then NAB becomes more charged than ever,” said Shah.